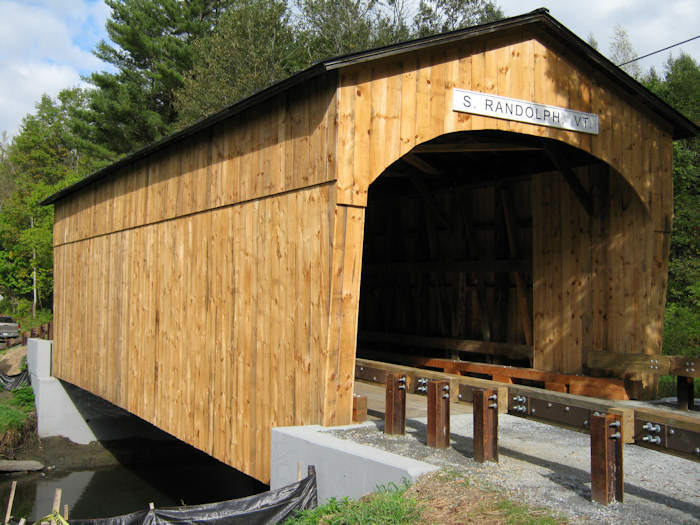 The work on the Kingsbury Covered Bridge was completed on Thursday, September 16, 2009 by the Wright Constuction Company, Inc. of Mount Holly, Vermont. Work began June 15, 2009. The engineers estimated cost for the work was $397,000; the winning bid was $307,168. The project was funded by a congressionally funded earmark; Federal funds for the project were 80%, State 20%. The photos are courtesy Hoyle, Tanner & Associates, Inc. The renewed bridge shows some improvements; Lateral, or "X" bracing has been added to the roof system and curbing added to the floor system protecting the trusses from moving traffic. Noteworthy are the new guardrails. This photo and the one below show the new curbing and the renewed kingposts and braces replacing original fabric lost to decay. The siding has been renewed, faithfully replicating the original. The original abutments have been replaced with those of cast concrete. The gable end of the Hyde Bridge, or Kingsbury Bridge, is marked by a large sign that says "So. 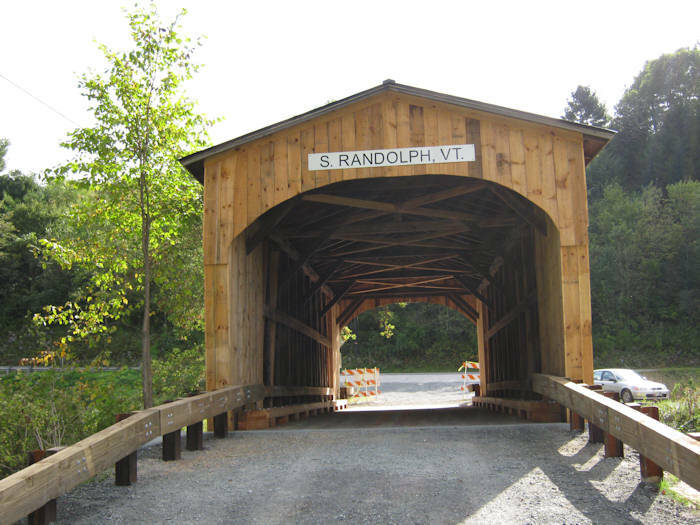 Randolph, VT." The Hyde alone among the nine area bridges features rounded portals. 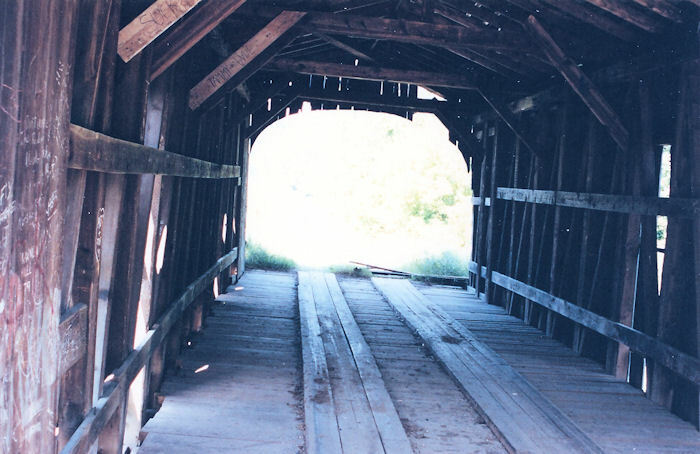 The span was built in 1904 and restored in 1980. Since then, it was closed to traffic for a number of years because of ice damage. 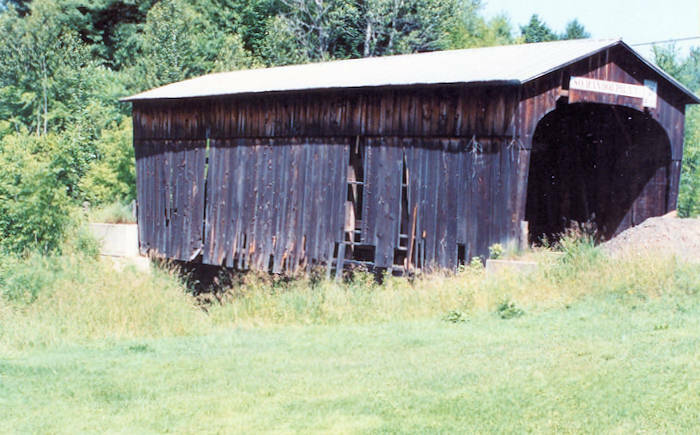 The damage did not deter a farmer who used the closed bridge for storing his equipment out of the weather. It was reopened in 1994 after reconstruction. 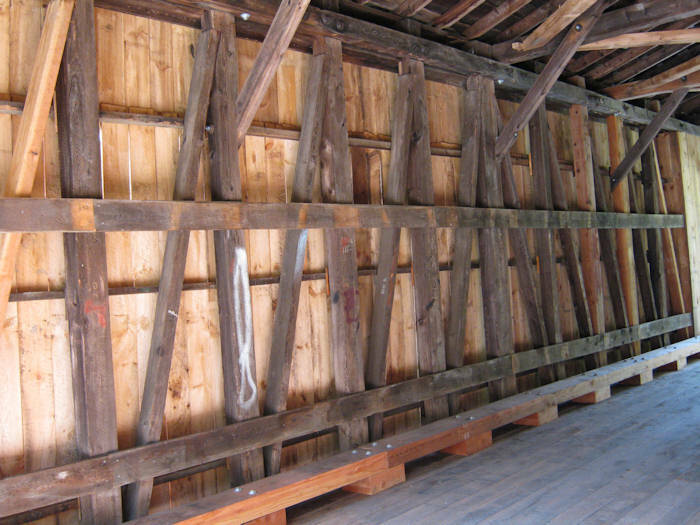 Portions of the top and bottom chords, several vertical truss-members, and some of the bracing was replaced. 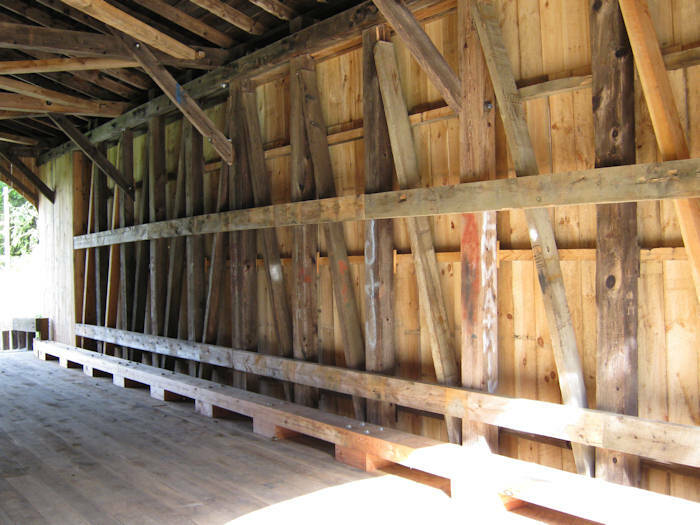 A bearing block and some bolster beams were renewed. The fifty-two-foot multiple-kingpost span stands next to Route 14, 2.8 miles south of the Gifford Bridge behind a grassy park with a picnic table. The Hyde serves an unpaved dead-end road, providing access to fields and meadow land.